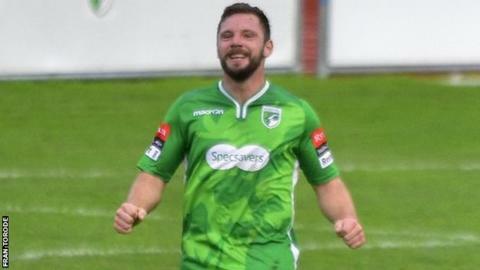 Guernsey FC boss Tony Vance has hailed the recent form of forward Craig Young. The 29-year-old has scored in three of Guernsey's last four games and been a key part of the side which is unbeaten in their last nine matches. "He's scoring goals now, and one of the things with Craig is when he gets a run of games, invariably he gets better and better," Vance told BBC Radio Guernsey. "For us that's fantastic, we've got to keep him going, keep that momentum going for him, and the team." The Green Lions have won seven times in their recent unbeaten run, form which has seen them go third in the Isthmian League Division One South. Guernsey travel to eighth-placed Hastings United, who have four games in hand on Vance's side. But as Guernsey look to extend their unbeaten run into double figures, Vance said there was still room for improvement. "We've got to be a 90-minute team," he added. "You're never going to dominate completely, but there are spells where we have a wobble and we do concede sloppy goals. "We've worked so hard on the defensive aspects of our game but we're still conceding the odd goal here and there, and it means when you do that they've got to score at least two to win a game."